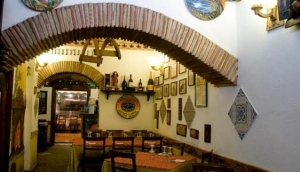 Pizzerias in Sicily are lively and bustling places, widely spread around the island and ideal for cheap and fast meals. Pizzas in Sicily are like nowhere else, they taste great and you won't find any funny toppings like in some pizzerias outside Italy. One Sicilian pizza is called Faccia di Vecchia (the face of the old woman), made with breadcrumbs, onions, cheese and tomato sauce. It is totally scrumptious and very filling, cooked in a traditional way in a wood fired oven (forno a legna). All pizza comes flat and crispy, no deep pan fried and squashy nonsence served in foreign pizzerias. Many restaurants have integrated pizzerias, and also the take-away pizzas and home delivered pizzas are not comparable to what you are used to at home. This is the really sad empirical value of my Germany, Greece, Spain, France and England trips - where very often the pizzas don't even deserve the name.